In between chauffering patients from unnerving eye procedures to more agreeable corners of the world and spending more hours than one should care to muster on the dispiriting lengths of the British motorway, I've been somewhat of an excuse for a blogger this weekend, really. No, really, you don't have to be kind; it's the truth. For this palpable disregard for you, my readers, I can only express my most forthright sorry-ness at a regrettable lack of posting. ANNARVITIELLO will be back in full force tomorrow. 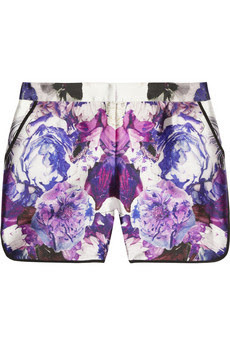 But for now, I leave you with number one on my holiday lust-list, these Prabal Gurung shorts. Various superhuman cognitive powers had enabled me to envisage these beauties with my new Balenciaga sandals eons ago. But as I inch ever closer to raising the necessary funds that will eventually entitle me to ownership, the lust is emerging at an alarming rate - somewhere between a sloth and a phoenix. To tell you the truth - friends don't keep secrets, do they (can I call you friends, friends?) - I have broken many a commandment. But it is the fourth (fourth, was it?) commandment re: coveting other's possessions that I break most often. I want the whole collection.